For thirteen seasons Bing Russell played Deputy Clem on Bonanza. He also had roles on Gunsmoke, Mod Squad, The Streets of San Francisco and most noteworthy The Magnificent Seven. Outside of acting he had a deep love of Baseball. Bing was a student of the sport. He was so deeply knowledgeable on the subject of Baseball that he made instructional videos on how to coach it. The videos were apparently so well made that several MLB teams used them. In 1972 Bonanza was cancelled and Bing was unemployed. He had begun to lose interest in acting and was in something of a slump. Around the same time Portlands minor league baseball team had been sold and moved out of state. After 70 years the city of Portland was without a baseball team and after 20 years of non-stop acting Bing Russell was without a job. 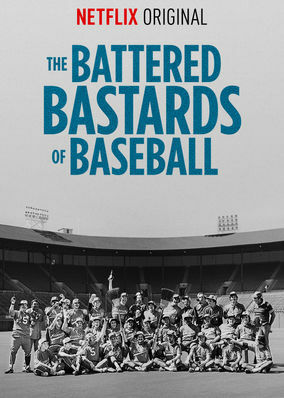 The Battered Bastards of Baseball tells the story of how an actor started the only independent Class A team in the North West League. The film is comprised of stock footage and interviews with players, writers, actors, fans and anyone who remembers the Portland Maverick's. This is a near perfect underdog story. Bing kept a roster of 30 players (an exceedingly high number compared to other teams) simply because he felt some of the guys deserved one last shot and that is the very essence of this film. These were players who were on there way out, struggling to find a way in or had never played at the professional level. Players who for the most part had nowhere else to go. Bing had one simple mantra for his team, fun. Winning was important too, but most of all he wanted the players and crowd to have a good time. Despite being underdogs The Maverick's were made up by players who would eventually go on to be nominated for Oscar's and Pulitzer Prizes. I had never heard of The Maverick's before this film but I was really touched by their story. My complete lack of knowledge and interest in baseball in no way took away from my enjoyment of it. Much like Hoop Dreams you don't have to be a sports fan for this one. This is the story of how one mans dream became the dream of many. I'm sure people will say this is the real Bad News Bears and while that's true on a surface level this is a far more compelling story. This movie is really a story about second chances and humanity. Most people carry around a certain amount of regret and questions the decisions that make up their lives and if one thing should be taken away from Bing Russell's story... remember to have fun, a simple but truly important lesson to learn. When asked if The Maverick's would ever have a reunion a player said "too many players are in the witness protection program."